From synchronised pulses to a relic rescued from the mists of history, the experimental harp maverick clocks on for hcmf//. Somewhere on an alternate timeline exists a world in which Rhodri Davies became a successful horologist. ‘My grandfather had a jewellers shop, selling and repairing watches,’ he says, recalling his youth in Aberystwyth. ‘Then my father took over the business. And I didn’t, and neither did my sister,’ he laughs. Instead, the siblings – his sister is the violinist Angharad Davies – became two of contemporary music’s most celebrated improvisers. Yet although those lost piles of watches ticking away unsynchronised seconds provide inspiration for Transversal Time, Rhodri Davies’ work for eight musicians that premieres at hcmf// 2017, it’s tempting to divine some deeper, more lasting connection between the intricate mechanisms pored over and Davies’ relationship with the harp, which has yielded more than two decades of exploration, deconstruction and rebuilding. Although classically trained on the orchestral pedal harp, Davies’ interest has long reached beyond the conventions of that instrument. He has played harps from a range of cultures; modified their sounds with bowing, preparations and amplification; built ones played by the elements; created fragmented harp installations and destroyed countless strings, and sometimes more, in performance. Along the way, he has found many kindred spirits, including a duo with John Butcher, membership of Apartment House, his long-running groups Common Objects and The Sealed Knot, as well as adding to the contemporary harp repertoire through work with Christian Wolff, Phill Niblock, Ben Patterson, Alison Knowles, Mieko Shiomi and Yasunao Tone. With such an expansive approach it’s ironic that Davies came to prominence through the London-based improvisation scene often known as ‘reductionist’, finding an alternative to what he characterises as ‘often a male, heroic spectacle’ through intense focus on smaller, microtonal sounds, subtle timbral changes and room ambience. ‘One thing I liked about that was being in a space with other people and the sounds all around you,’ he remembers. Two decades later, he sees a connection between his attraction to this approach and In Praise of Blandness, François Jullien’s provocatively titled study of a philosophy vital to traditional Chinese culture. ‘I should have read this book ages ago, I guess, because a lot of it related to those concerns,’ he says. ‘One could be forgiven for thinking of a ‘bland’ sound as being a negative thing but it’s key to Chinese aesthetics in art and poetry. While Jullien’s book and Davies’ watch-filled childhood provide inspiration for Transversal Time, the workings of the piece itself are based upon different ways of dividing up the onward march of the universe into ever more intricate units. During the performance, each of the eight musicians will be guided by a personalised pulse, for example, decimal time or hex time – ‘I think that works out at about 1.318 of a regular second and then one decimal second is 0.864 of our regular seconds,’ Davies explains. ‘I was also interested in different cycles; for example the mains frequencies in Japan are 50 and 60Hz. Researching ways of marking the different systems with pendulums, water clocks, hour glass and mechanical clock movements, Davies eventually settled on rhythmic light pulses as he liked the idea of illuminating the individual musicians’ faces onstage; enlisting academic and musician Adam Parkinson to design a suitable computer program to control the effect. Yet with an international ensemble of seasoned improvisers – Ryoko Akama, Sarah Hughes, Catherine Lamb, Stíne Janvin Motland, Pia Palme, Pat Thomas and Dafne Vicente-Sandoval – on board, he’s keen not to over-regiment matters. ‘The key to this piece is the people who will be playing it and their ability to improvise with their instruments or voice. So I would like there to be this relationship to time; I would like it not to be a straitjacket or something that they feel stuck in. I’m thinking of a more fluid relationship,’ he says. Such an approach also chimes with Davies’ own performances of works in Eliane Radigue’s OCCAM series, his minutely controlled and sensitive harp tones helping realise the synthesiser pioneer’s late-life switch to acoustic composition. ‘What I like about Eliane’s music is that it starts from nothing but it feels as though it’s always been there, and then goes back to nothing, but as if it’s just further away and is still happening somewhere in the world,’ he says. By way of sonic contrast, Davies’ hcmf// concert also includes his solo work Wound Response – the performance of which he will dedicate to former collaborator Gustav Metzger, famed for his ‘auto-destructive’ art – where he breaks the harp strings through over-articulation. ‘The challenge is that I don’t know which strings are going to snap, in which order,’ he says. ‘Sometimes I’m left with five or six notes.’ Similar abrasive sounds can be found in his guest spots on albums by the avant-folk singer Richard Dawson and in the pair’s project Hen Ogledd (since expanded to a trio with Dawn Bothwell), born out of a friendship nurtured when Davies lived for several years in Gateshead. Now back in Wales, Davies is as busy as ever, including a role as Associate Artist at Cardiff’s Chapter Arts Centre and bringing the likes of Evan Parker and Philip Corner to Swansea as part of the NAWR concert series. 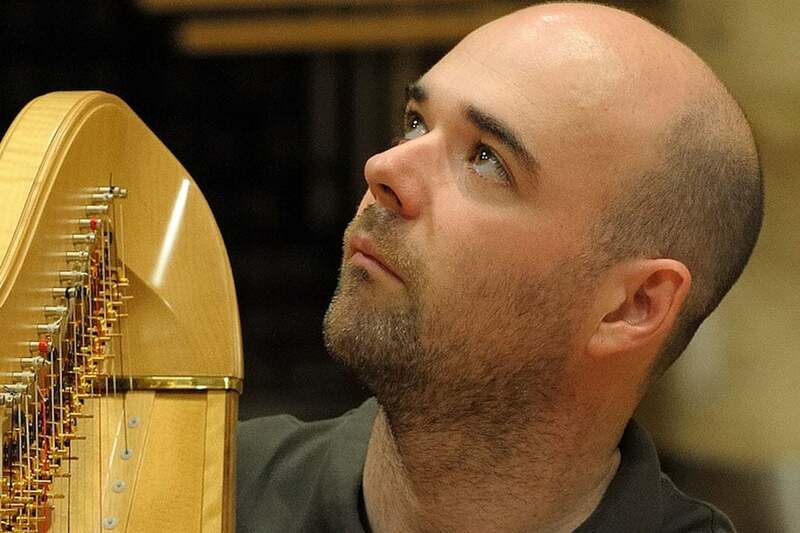 There’s another harp on the horizon, too – Wales’s earliest recorded example, the Telyn Rawn. And as for what the Telyn Rawn actually sounds like… the only certainty is that, in Davies’ hands, it will be no museum piece.